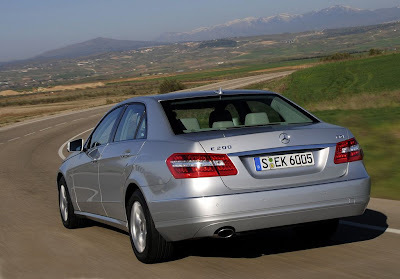 Mercedes-Benz announced that two new four-cylinder powerplants, a diesel and a gasoline with direct injection will be added to the engine-line-up of the 2010 E-Class. 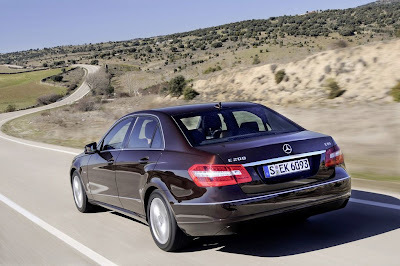 The E200 CDI BlueEFFICIENCY features a 2.2-litre turbo diesel with an output of 136HP enabling the executive sedan to accelerate from zero to 100km/h in 10.2 sec and reach a top speed of 210 km/h while returning an average fuel consumption of 5.2 litre per 100km. The 1.8-litre turbocharged petrol engine in the new E200 CGI BlueEFFICIENCY delivers an output of 185HP. The sedan hits 8.5 seconds from standstill to 100km/h and has a top speed of 232km/h. When equipped with the standard six-speed manual gearbox, the E200 CGI consumes 7.2 litres of premium unleaded petrol per 100 kilometres. Both models will be launched across Europe in September with prices in Germany.